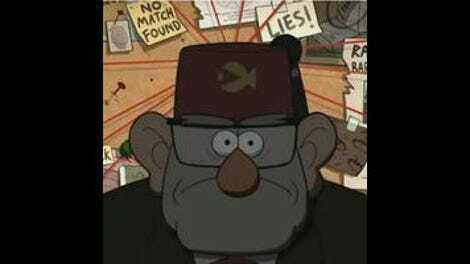 I’ll be honest: I don’t particularly care about Stan’s top-secret plan or the true nature of the journals. I mean, I’m intrigued to find out just where the show is heading with Stan’s newly revealed, 12-fingered twin brother, but that brings us to a payoff that we still haven’t really reached. Whatever answers lie ahead in the next episode aren’t yet part of the show’s story, except in the vaguest possible terms. 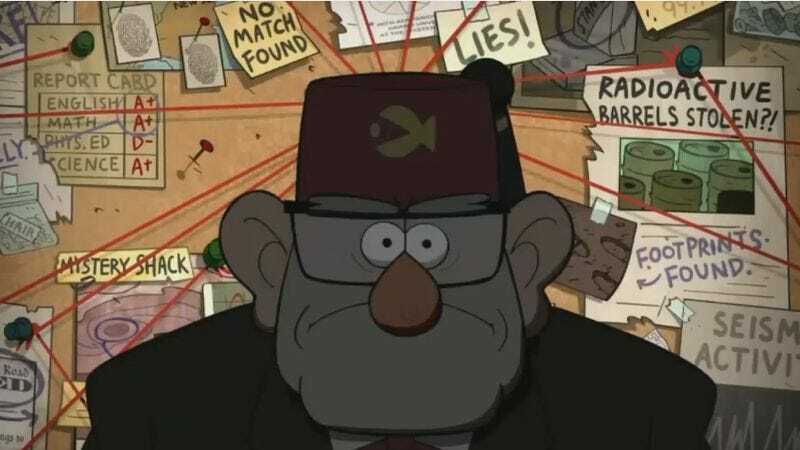 And really, even when Gravity Falls does officially fill in those gaps and explains precisely what has been going on, all we’ll be talking about is information, and there’s a limit to how compelling such narrative data can be. If what the show reveals happens to accord with your own speculations, that can be satisfying, as can a complex conspiracy plot that manages to fit together with minimal convolutions. But there’s still only so much mileage for the show to extract from the simple recitation of previously unrevealed facts. At a certain point, this information has to matter somehow, and the best way to do that is to reveal just what Stan’s schemes mean to the characters affected by his secrets. And that’s where “Not What He Seems” is such a triumph. The episode never loses sight of the human cost to Dipper and Mabel. In the former case, the episode smartly picks up on the more abstract, cerebral aspect of his story—everything to do with the journal—by incorporating it into the more general hurt that Dipper feels when he realizes just how much Stan has been lying to him and his sister. Mabel feels betrayed because she always assumes the best in people, and she is ill-equipped to deal with those who so completely disappoint her, but Dipper has a more specific reason to react so negatively. While Dipper has found plenty of other roles to play on Gravity Falls, he has always made a point of casting himself as the bold seeker of knowledge, the confronter of paranormal mysteries. For Stan to hoodwink him so thoroughly isn’t just embarrassing, it’s downright offensive to Dipper. More than anything else, Dipper is about the truth, and so the back half of this story is defined by rejecting the liar in his midst and doing everything he possibly can to bring the truth to the surface, in the hopes that such truth will start to make things better. He wants to stop Stan not just because he believes the machine will unleash doomsday, but because he simply can’t believe anything Stan says about it. Mabel is different, and the episode acknowledges the distinction between the Pines siblings by how it handles their interactions with Stan at the end of the episode. Dipper can come across as the absolutist in his dealings with his great-uncle, but that isn’t quite the case: He is furious with and distrustful of Stan right now, but that could change in the next episode if he becomes privy to some deeper truth that explains why Stan acted the way he did. As bad as things look for Stan and Dipper at the end of this episode, their relationship is salvageable. But Mabel is the arbiter of something much more crucial: If she rejects Stan at the end of this episode, it isn’t just their relationship that is unsalvageable. If Mabel gives up on him, Stan himself would be beyond all hope of redemption, as there’s no good way to bring Mabel back if she makes the decision that Stan can never again be trusted. What this then means is that “Not What He Seems” is less about the machine coming on or Stan’s brother coming through the rift—those are both things that happen, but they aren’t what this story is about—but rather about assessing whether Stan is still at all worthy of the twins’ trust. There’s plenty of room for disagreement in making that evaluation, and it’s honestly easier to see Dipper’s side of this than it is Mabel’s, but the episode is careful to layer in the clues that help explain why Mabel would ultimately make the decision she does. After all, even when in the final 24 hours of the countdown, Stan is still his usual incorrigible self, helping the kids light fireworks and letting them clean up the mess with water balloons. More than that, when he’s actually in his secret lab, he keeps a photo of Dipper and Mabel on the table, suggesting that, whatever else he might be lying about, his love of the kids isn’t remotely one of them. Mabel, desperate to prove that Stan is, well, not what he seems, is quick to seize on that particular detail. And honestly, I’m convinced on that point. Maybe this man we’ve met over the course of the past two seasons isn’t Stan—though I suspect rumors of his false identity have been exaggerated, if not outright distorted—but he sure as heck is the kids’ grunkle. “Not What He Seems” soars because of its keen character work, and indeed it’s the show’s attention to Mabel and Stan’s relationship that allows this episode to have a conclusion that is satisfying quite apart from the big cliffhanger: Sure, I’m curious to see where the show goes with Stan’s brother, but Mabel deciding she still believes in Stan represents an important endpoint in and of itself. And the animation offers such strong support for the episode’s storytelling, with the later portions of the story adopting a sunset-specific color scheme that heightens the sense that we are witnessing the end of one era of the show’s history and, if we’re lucky, the beginning of the next. There is a melancholy, almost funereal quality to the episode, one brought out by and affirmed by the color choices. Plus, when it comes time for action, the episode delivers in a big way, as the gravity anomaly sequences represent the show at its most technically ambitious. In theory, this is another episode that puts off revealing anything until the literal last minute, but this time the episode offers the audience as much spectacle as possible on the road to that point. And, though it’s easy to forget, the jokes have a vital role to play here as well. By Gravity Falls standards, “Not What He Seems” is an unbearably tense episode, and so the show leans on the townspeople to offer some respite from the ratcheting emotional drama of the Pines family. Sheriff Blubs and Deputy Durland are in fine form, wandering into far more serious law enforcement scenes to remind us how woefully inadequate they are for the task of policing Gravity Falls. Will Forte is on hand as the cute biker, getting some of his most sustained dialogue ever as he reacts to the unfolding craziness. The Corduroy family is well-represented, as Manly Dan reveals his borderline psychotic love for the boy band Sev’ral Timez, while Wendy shows up bright and chipper for work only to catch sight of the FBI and immediately rethink that plan. The skill here is that the jokes are carefully balanced to support the more serious material unfolding elsewhere; Gravity Falls is smart enough to pick its spots and wring maximum laughter when the moments of silliness do come. Honestly, this is an episode that’s strong enough it doesn’t need the jokes. The fact that it accomplishes all it sets out to do and still brings the comedy? Oh, that’s an instant classic right there. Soos is great here, and there’s plenty of poignancy in his initial willingness to take on the kids to please Stan, followed by his proudly taking on the new mission of defending the kids from Stan himself. Also, he is on point about his fast food priorities. Got to get that one fry placed directly in your mouth, just to know you mean business. We’ve got some bonus Gravity Falls content coming tomorrow (or, um, later today), as Erik Adams will be chatting with show creator (and Grunkle Stan voice) Alex Hirsch about that big cliffhanger. Look out for that on the main site.